As periodontal disease progresses, the pockets between the teeth and gums become deeper providing a larger space for bacteria to live. This results in further bone and tissue loss. In order to slow down or hinder this bone and tissue loss, pocket reduction (osseous surgery) is recommended. During Osseous surgery, Dr. Sutherland lifts the gum back to reach the areas that require the removal of plaque, tartar (calculus), and disease- causing bacteria. The tooth root is cleaned and smoothed. 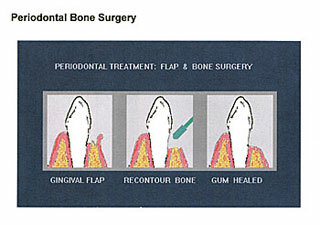 The affected gum tissue is trimmed away and the affected bone is re-contoured to allow the gum tissue to reattach to healthy bone. The gums are then sutured to a new position that will be easier for the patient to clean at home on a daily basis.